After a recent press trip to the Saborea Puerto Rico food festival, I wrote an article for About.com Caribbean Travel about lechón, Puerto Rico’s national dish. I grew up in New England, where a common festive meal was the clambake. Simple, local food—fresh seafood and shellfish, vegetables and starches—steamed in a fire-heated pit of seaweed and seawater. Thinking about clambakes makes me feel all warm and fuzzy inside (not to mention hungry). 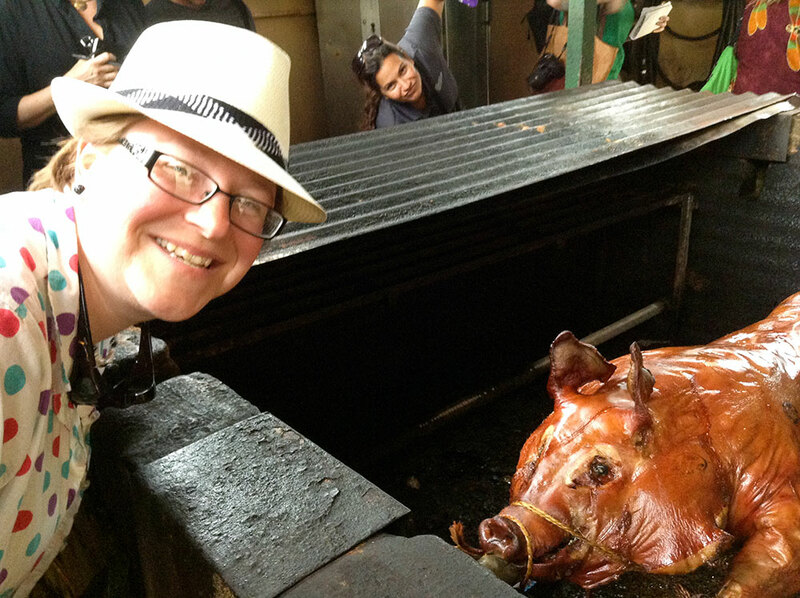 In many parts of the world, spit-roasted pig is the local version of a clambake. Called lechón in Spanish, it is a custom in Latin America, Cuba, the Philippines, Thailand, Spain, among other places. In Puerto Rico, it is the national dish, and locals will tell you that Puerto Rican lechón is the best! In my original draft of the piece, I went off on a tangent that, due its not really fitting in with the whole “travel” theme, was cut. However, it totally fits in with the tone of this blog here, so I’m gonna post it! After you read the article on About.com, return here to rest the rest. [Chef Roberto] Treviño disagreed. He told us that Puerto Ricans, young and old, who ate the traditional diet of the region were very healthy and very strong. He pointed to a combination of their physical activity and their locally-sourced, real-food-based diet. Many Puerto Ricans eat lechón almost daily: They’ll roast a pig, which will provide them with meals for days. They’ll have it with eggs and rice for breakfast. Those who buy into the low-fat, whole-grain standard American diet dogma will surely balk at this. But we are hearing more and more about the health benefits of traditional diets. The evidence is as simple and as compelling as a tender, juicy piece of seasoned, slow-roasted pork. Eating simple, local, real food—no refined grains, no processed food products, no calorie counting—now that’s fuel for your body. Additionally, I believe that the way we eat can also impact our health and our enjoyment of the food. Lechón is a festive occasion, food to be cooked and eaten with our closest friends, our family, our community. Sharing food is primal: It was an integral part of our communal life before modern civilization fragmented us all. According to one blogger, “Eating identical organic matter creates an enduring cellular connection between people that lasts well after the food’s been digested” [The Sweet Beet]. It’s the “breaking of bread” that brings us closer to together. It probably helps us to digest our food better, too. The power of food extends beyond mere fuel, mere caloric content, mere immediate gratification. It reaches into our depths, into our personal memories and our cultural histories, into the ancestral genetic code that is buried deep but strong as ever, in spite of (or maybe even because of) our modern individualistic culture replete with single-serving, pre-packaged convenience foods and brown-bag lunches. Lechón—and its cultural equivalents around the world—is, for these reasons, the ultimate gastronomic experience.